If all of NH government was funded by OHRV speeding tickets it would be the most amazing fiscal accomplishment. Is revenue, that’s budgeted for, based on tickets that are unjust- Unjust itself: YOU BEST BELIEVE IT! I would argue that raising it to 65 would be safer than the restrictive 45. 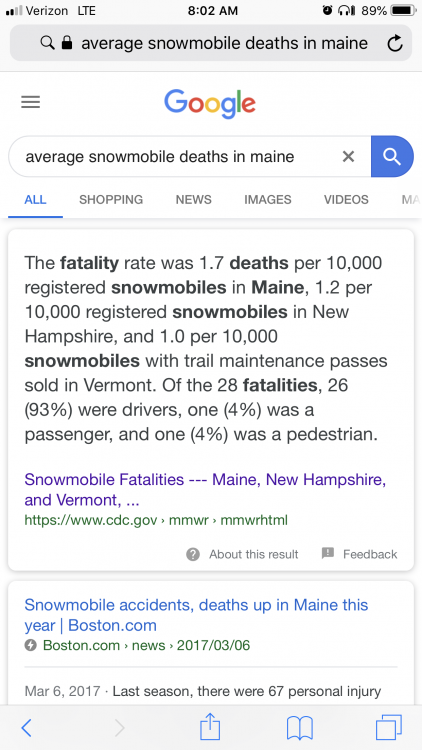 So, states with high, or no, speed limits should have a better safety record than NH? 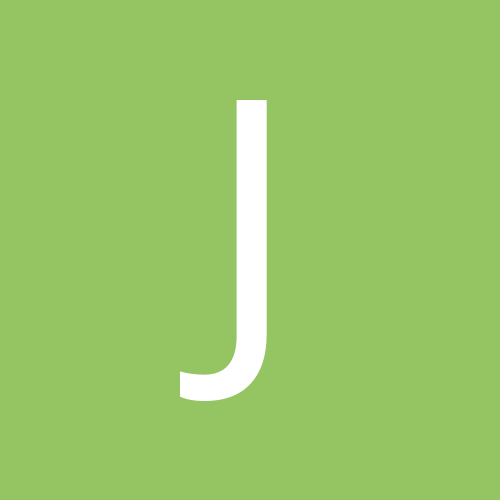 Could you point me towards that data? 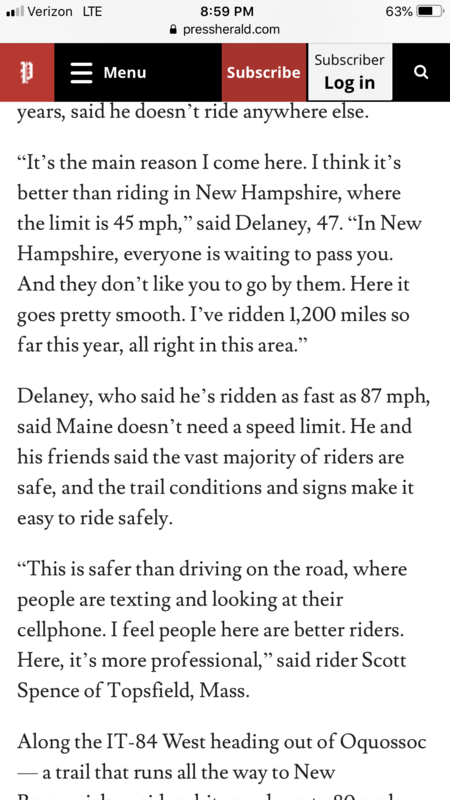 New Hampshire seems to be pretty much middle-of-the-road on speed limits. As far as Vermont, Vermont snowmobiling isn’t even in the discussion. 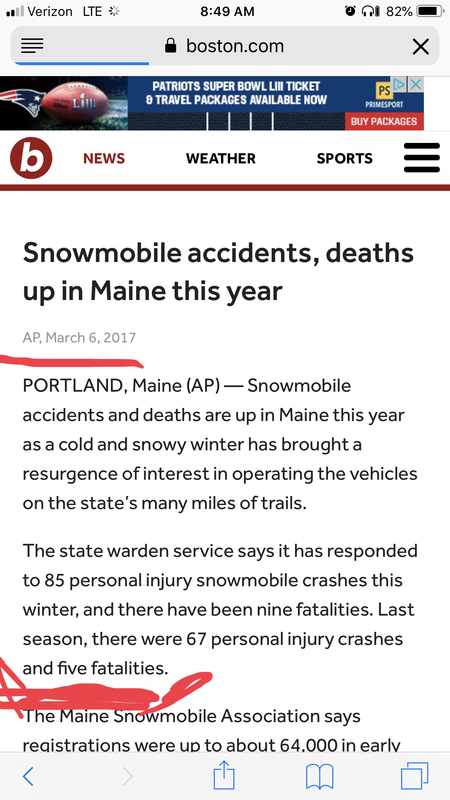 In 2017 Vermont registered an average of 21k sleds. There trails is small, skinny, although great scenery- I’ll leave it at that. 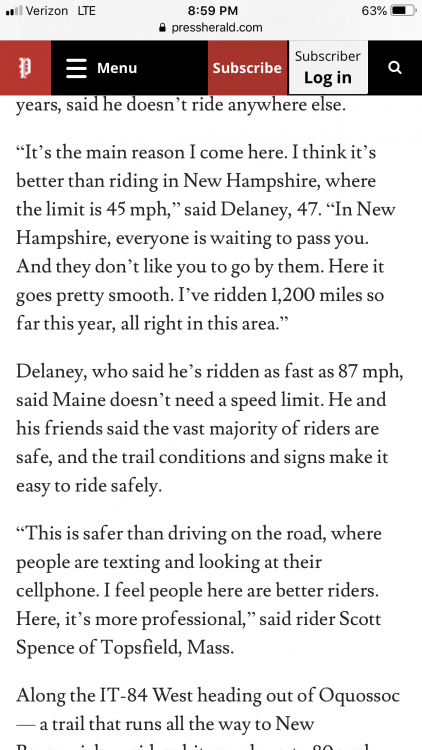 Here’s an interview with a local Maine rider talking about some personal opinion that falls in line with my and many others opinions that the 45mph doesn’t help with safety but deters safety. The speed limits... which have been around for decades... are based on comparable travel ways throughout the State. 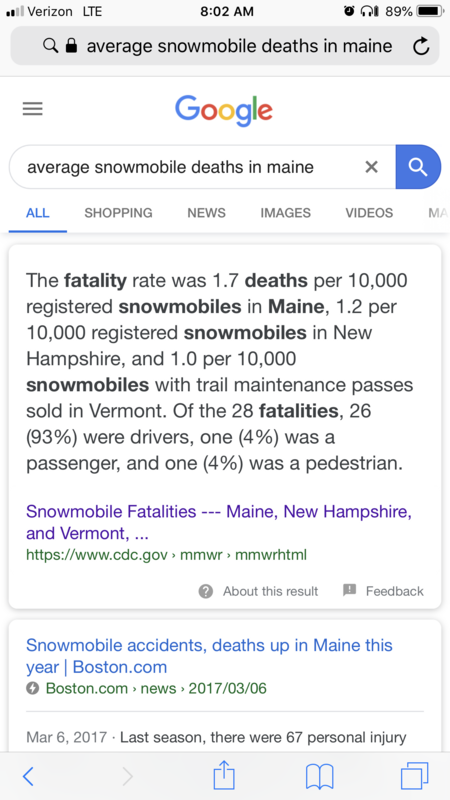 The only travel way that I know of that is posted at 65 or above is I-93, a unilateral direction travel route with multiple travel lanes and breakdown lanes. Rte 106 is a bi-directional travel way, but it has an upper posted limit of 50, I believe. It also is only legally accessible by drivers/riders that have passed specialized testing and restricted age requirements. OHRV has had the upper trail limit lowered to 35, and continues to grow... so I don't think the speed restriction is a winning legislative issue. But just for the record... we see the ''cost equation'' in almost every facet of the tourism industry. Well my fellow rider, I Strongly disagree! I think you are so wrong that it’s visible that if this these terrible ideas continue it’ll be devastating. Many major highways in NH have recently increased their speed limits because vehicles are safer than ever and going faster is so common that NH caught on. our equipment can handle faster speeds. 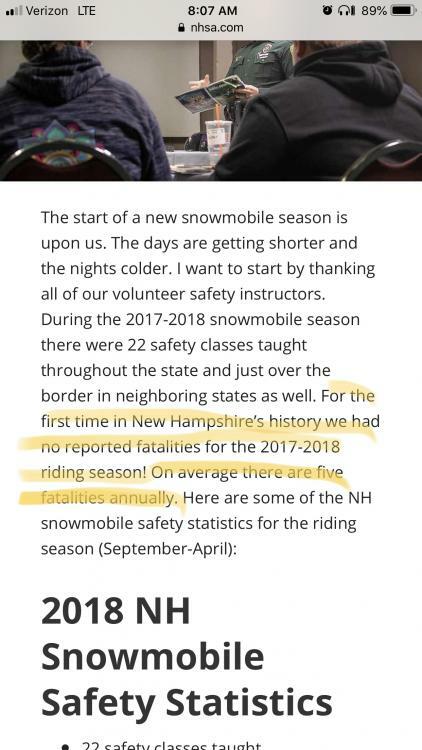 I mean NH has LITERALLY been blasted by Hundreds of riders over the recent years on Social media for our speed limits. They are ALL going to Maine. They aren’t getting out of the sports. More young people than ever are buying up sleds. $1500-$3000 they can get a solid sled. 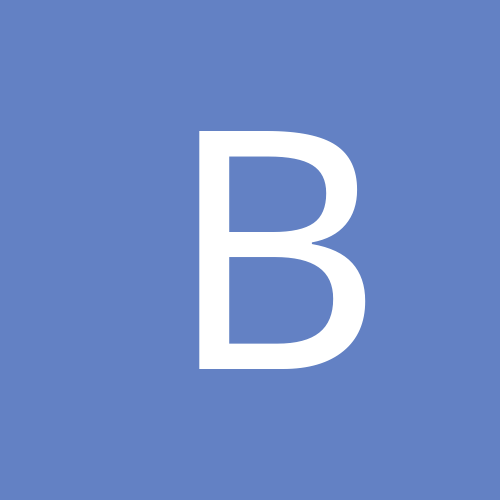 3: cheaper lodging and 2nd homes. You can buy a full house in northern Maine for $50k and use it as your vacation home for ENDLESS out door fun in Maine. but you want to Jack the registration prices up so my registrations go from $160 for 3 sleds to $300 a year and I have to deal with speeding tickets and massive crowds in Pittsburg. Or I can go the same travel time into Maine and get a place for much cheaper with almost no crowd. Maybe buy a foreclosure in Mexico Maine for $40k and fix it up over a bunch of beers and pizza! Steve its TOTALLY EASY to "argue the merits of camp Sno-Mo from the outside looking inward,,, I could easily join you on this topic ,,,,, HOWEVER you may want to take the time this Saturday eve to go to the Andover Pasta Buffet (at the Middle school) and take a gander at the way in which everyone pulls together for a common goal,,,,,,, the meal easily fits YOUR budget/price range (jk-jk) bring a 20 to buy some raffle tickets for a tons of prizes they have ,,,, REMEMBER to take a hard look at how this brings community together,,, and provides a imesureable service to families that have a child that couldn't do camp otherwise!!!!!! You missed Warners last Saturday, and Canterbury the Saturday before! hope to see you there!!! !